Image example Na for 29 May, 2019 dem go swear-in Buhari for im second tenure wey go finish by 2023. Before im swearing-in for 29 May, 2019 for im second tenure President Muhammadu Buhari don already dey tink of how di kontri go be for 2023 as im say im go leave Nigeria better dan wen im enter office. Di Presido tok dis one for meeting wit members of Christian Association of Nigeria (CAN). Buhari say im administration go kontinu to address important national challenges wey include security, economy and corruption. Di CAN leadership wey Rev Dr Samson Ayokunle lead go Aso Rock been go congratulate di president for im re-election. President Buhari say im goment go strive to "kontinu di peaceful co-existence among all Nigerians irrespective of dia religious beliefs." And dem go make sure say "in di area of allocation of political offices, dia focus go dey on merit and national spread such dat every party of Nigeria go have sense of belonging." 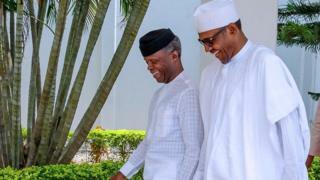 For im congratulatory message di CAN president pray say make God grant President Buhari "everitin e go take to perform hundred times better dan" his first term. Rev Ayokunle also call for ethnic and religious balance for di selection of leadership of di ninth National Assembly.